According to the Insurance Institute for Highway Safety, 30,057 fatal motor vehicle crashes occurred in the United States in 2013, and 32,719 people died as a result of these accidents. Often, and for varying reasons, surviving family members or friends erect an ad hoc, spontaneous memorial at or near the scene of the fatal accident, such as the one pictured above, in honor or in memory of their loved one. As you motor along with your local roads and highways, you might occasionally notice a small memorial along the shoulder or situated several feet beyond in a grassy area or atop an embankment. These roadside memorials (known as descansos in Spanish) can appear anywhere, such as at intersections, curves in a road, near guardrails, etc., and generally denote where an individual experienced an automobile accident that resulted in his or her death, whether immediately or later as a result of injuries suffered. A religious symbol, such as a Christian cross, Star of David, etc. Memorabilia, such as teddy bears, toys, CDs, beer or alcohol bottles, clothing, flags, pinwheels, etc. A colorful ribbon and/or balloon(s) tied to a tree, street light or telephone pole, etc. The use of roadside memorials or descansos dates back more than 200 years, and this form of spontaneous memorialization is particularly prominent in the American Southwest, especially in Arizona, New Mexico, and Texas. The tradition in the United States is thought to have originated with Latin Americans, who placed such memorials in locations where people died, but denoting and honoring such spots occurs worldwide and is a much older practice. Opinions remain divided on the use and presence of roadside memorials in the United States and elsewhere. Obviously, the surviving family members and/or friends of the deceased support their creation and presence, but many people object to such homemade shrines for various reasons. Sometimes, the placement and/or size of a roadside memorial creates a legitimate hazard for motorists, who might find a memorial distracting or a visual traffic obstruction. Others object to the use of religious symbols on public property, considering it a violation of the constitutional principle of separating "church and state." Other people protest against roadside memorials purely on religious grounds, because such shrines can obstruct construction projects, or due to the fact that creating and/or maintaining roadside memorials can endanger human lives. On the other hand, many people believe that roadside memorials serve a beneficial purpose, such as reminding motorists to slow down and/or drive carefully, or signaling that a particular stretch of roadway might be dangerous. Still, others dismiss any objections altogether and argue that such spontaneous memorialization provides no greater distraction than the road signs and advertisements littering our roads and highways already. Given the highly emotional and personal nature of such homemade shrines, each U.S. state regulates the legality of roadside memorials within its borders (there is no federal law), and, as you might expect, the laws vary depending on where you live. Some U.S. states, such as Colorado, Indiana, Montana, North Carolina, North Dakota, Oregon, and Wisconsin have banned roadside memorials entirely. Other states, such as Florida, Utah, and Washington, prohibit such ad hoc memorials but offer a state-approved alternative—a roadside sign that encourages motorists to drive safely and bearing the name of the deceased. (Surviving families must request and pay for the installation of these signs.) Delaware offers a memorial brick program in which survivors can pay to have the name of a loved one engraved on a brick that forms a memorial garden maintained by the state. A few states, such as Alaska and West Virginia, have passed legislation that actually encourages surviving family members and friends to create/maintain roadside memorials, but most U.S. states and/or cities fall somewhere between these extremes. For instance, Norton, Massachusetts, passed an ordinance in 2005 limiting the presence of roadside memorials to 30 days, while a mother in Dowagiac, Michigan, was forced to repeatedly replace the roadside memorial in honor of her son six times in just three months because somebody kept removing it despite the fact that the state doesn't ban roadside memorials (although Michigan does prohibit creating roadside hazards). Ultimately, if you wish to create a roadside memorial, you should check the specific laws in your state and/or municipality. Even if your state does not prohibit these memorials, your city or municipality might. If a roadside memorial is not an option in your area, consider something like a memorial bench. "General Statistics: State by State 2013." Insurance Institute for Highway Safety. "Descansos pay tribute to dead, comfort to mourners" by Elaine Tassy, August 10, 2014. Albuquerque Journal. 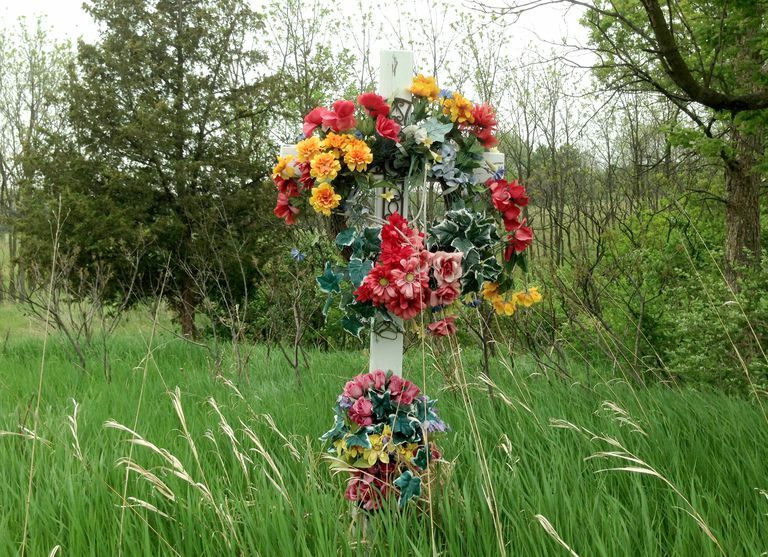 "Battles over roadside shrines more common" by Deborah Sharp, July 11, 2005. USA Today. "Crosses taken from roadside memorial" by Alyssa Marino, May 31, 2015. www.abc57.com. "Memorials on State Highways," 2014. Wisconsin Department of Transportation.